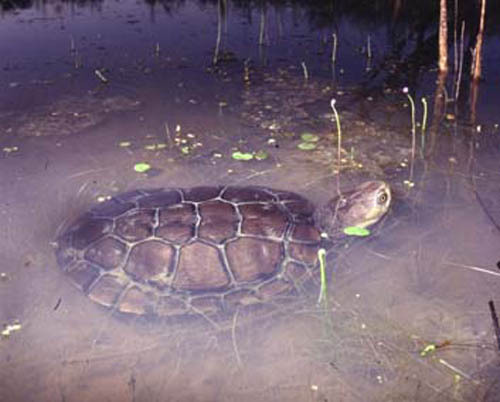 Pseudemydura umbrina, the Western Swamp Tortoise, is a short necked turtle, which is a single living member of the monotypic genusPseudemydura. The holotype [NMW89 (8450) = 1296] was collected and sent to the Vienna museum in 1839 by the Austrian J.A. Ludwig Preiss (Burbidge and Kuchling, 1994). Unfortunately, the exact location of the discovery is unknown. The specimen was simply labeled "New Holland" (Burbidge and Kuchling, 1994). Even though the holotype was collected in the first half of the nineteenth century, it was not until the year 1901 that the specimen was given its first name by Siebenrock, an Austrian herpetologist. In 1907, Siebenrock finished off the description when he provided further comments and details on the species (Burbidge and Kuchling, 1994). The species was considered to be extinct till 1958, when two specimens, which had been found in 1953 near Warbrook (30 km north-east of the city of Perth, Western Australia) and originally described as a new species Emydura inspectata, by Glauert (1954), were shown to be a synonym of Pseudemydura umbrina by Ernest Williams of Harvard University (Burbidge and Kuchling, 1994). Pseudemydura umbrina is the smallest Australian chelid turtle (Burbidge 1967, Burbidge et al. 1974). The maximal carapace length of adult males is 155 mm and the weight is 550 g. Females grow smaller attaining 135 mm of a carapace length and a weight of 410 g (Burbidge and Kuchling, 1994). 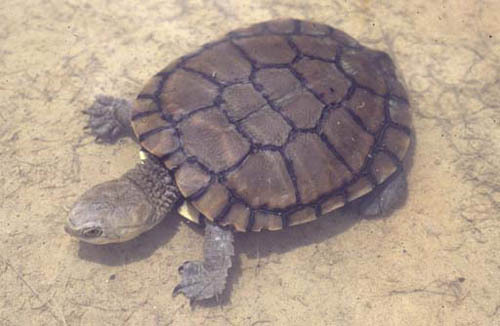 In fact, Pseudemydura umbrina is the only Chelonian where males outgrow females. "Hatchlings have a carapace length of 24-29 mm and weigh between 3.6 and 6.6 g (Burbidge and Kuchling, 1994)." In my personal opinion, Pseudemydura umbrina is the most peculiar turtle in the world. What really fascinates me about the genus is its oddity in comparison with the rest of the Chelonia world. Males being bigger than females, females digging their nests with their fore limbs, females splitting their shells in order to be able to lay eggs (Thomson, pers. comm., 2004) are factors that make this genus so unique. What's more, Pseudemydura umbrina is the world's most endangered turtle and deserves our special attention. Both photographs have been provided by Dr Gerald Kuchling of The University of Western Australia's Zoology Department.